This was one of his best pre-army rock songs which was always treated with respect and leaves us to regret that others from his vast repertoire were not afforded the same treatment. All so true, just think about the bonus songs "All Shook Up," "(Let Me Be Your) Teddy Bear"/"Don't Be Cruel" and "Hound Dog" on FTD's recent Standing Room Only. Pure standard routine stuff, not very exciting at all. The hard rocking "A Big Hunk O' Love" on the other hand, is, to use Madison's words, treated with respect. Being about 14 years old at the time, the song still sounds remarkably fresh thanks to a good arrangement with a driving rhythm. But there are other songs from the 50's getting the same, inspiring treatment on stage during the 70's. The one that comes first and foremost to mind is "Lawdy, Miss Clawdy" which Elvis sang all through 1971. He also rehearsed the song on March 31, 1972 and then sang it on tour in April. 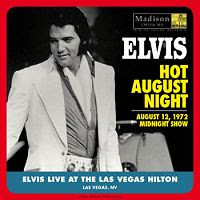 Watching the version from Elvis On Tour it's clear that Elvis is enjoying himself performing this classic. Another favourite from his early years must have been "Trying To Get To You," released on his first LP in 1956 and used regularly during the later concert years. In a way, this song reached another level with the powerful voice he had obtained by then. Finally I have to mention "My Baby Left Me" from Elvis Recorded Live On Stage In Memphis. This version is a fine tribute to the original and is really rocking along. The same can also be said for the next track on the album, the above mentioned "Lawdy, Miss Clawdy." Those are a couple of "pre-army" rock songs that I think Elvis never treated like throwaway numbers, and which were given a new, more modern sound with the help of some good arrangements. There are of course others, like his very first single "That's All Right." Which ones are your favourites?